NETWORK FINALS: In adjusted numbers, the SURVIVOR finale held its morning rating, but the REUNION SPECIAL fell 0.3 to 0.8. In addition, both season finales of EMPIRE and STAR gained 0.1 in final numbers, while the rerun of THE ORIGINALS lost the same. CABLE HIGHLIGHTS: ESPN had the night’s NBA PLAYOFFS game at a dominant 2.74. NBC Sports Net’s NHL PLAYOFFS game was at 0.91. The highest non-sports number of the night belonged to Bravo’s REAL HOUSEWIVES OF NYC, down 0.04 to 0.43. TBS’s FULL FRONTAL returned at 0.31. Fox News’s HANNITY led cable news at 0.29/0.51/3.2M, with MSNBC’s RACHEL MADDOW SHOW at 0.25/0.37/2.5M, and CNN’s ANDERSON COOPER 360 at 0.15/0.22/800K. On HGTV, BROTHER VS BROTHER returned at 0.28, HOUSE HUNTERS INTL slipped 0.02 to 0.25, and HOUSE HUNTERS was down 0.02 to 0.24. On Discovery, MISFIT GARAGE ticked down 0.01 to 0.27, and STICKER SHOCK was down 0.06 to 0.14. On TLC, MY 600-LB LIFE returned at 0.26, and SKIN TIGHT was at 0.15. On ID, SEE NO EVIL returned at 0.25, and MURDER CHOSE ME was down 0.04 to 0.23. 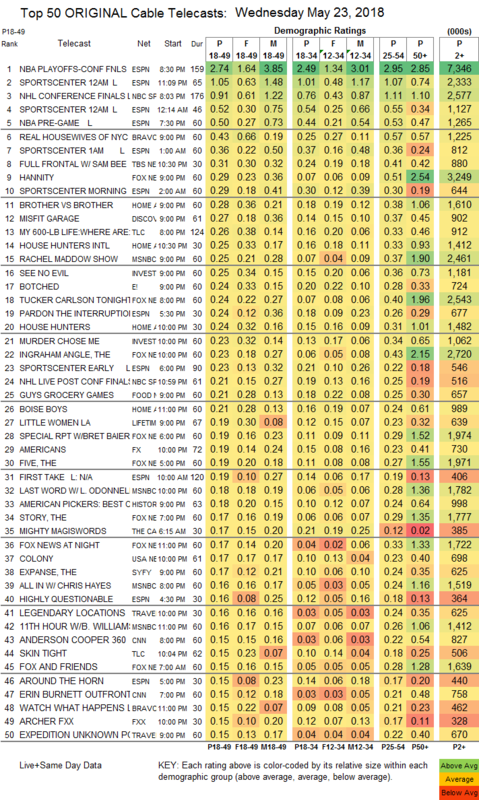 E!’s BOTCHED ticked down to 0.24. On Food Network, GUY’S GROCERY GAMES fell a tenth to 0.21. 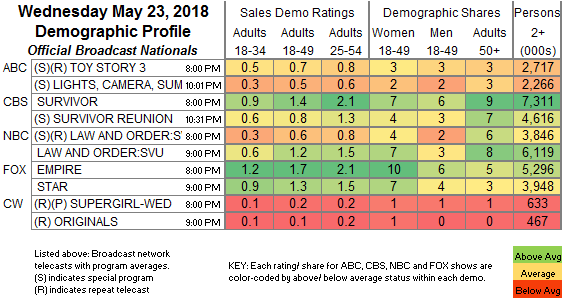 Lifetime’s LITTLE WOMEN dropped 0.06 to 0.19. The penultimate episode of FX’s THE AMERICANS rose 0.06 to 0.19. USA’s COLONY ticked up to 0.17. On Syfy, the maybe-canceled (pending Amazon) THE EXPANSE slipped 0.02 to 0.17, and the renewed KRYPTON (don’t ask us) was down 0.05 to 0.14. FXX’s ARCHER lost 0.04 to 0.15. Freeform’s FAMOUS IN LOVE was steady at 0.11. HBO’s BEING SERENA was at 0.07. IFC’s BROCKMIRE held at 0.06. POP’s HOLLYWOOD DARLINGS stayed off the chart, steady at 0.03/105K. Sundance’s THE SPLIT premiered off the chart at 0.02/88K.